An excellent torrent downloader for Mac, Folx makes downloading torrent files and creating torrents for various trackers extremely easy. Need to sync data in your Android with Mac? Folx PRO is an excellent torrent search tool - no need to visit multiple torrent websites in a browser to find what you need. We are sure that Folx is the best torrent search app because it will find torrent files without you leaving the app - enjoy the results from a multitude of trackers at a time. Once you see the torrent file that is exactly what you were looking for - click the Download option next to it. That’s how easy it is! Folx offers simple and convenient way to download torrent files: download tasks can be prioritized, download and upload speed can be regulated, while tagging feature enables quick search through downloaded content. Folx allows you to download torrents using files from trackers, as well as via magnet links. The latter is an increasingly popular way to make downloading and sharing bittorrent files even faster and easier. Using magnet links allows you not to explicitly announce that you are using P2P technology. The application splits the downloaded content in up to 20 threads, thus significantly increasing the download speed. The application lets you set the download time according to your convenience. You can also tell the application what to do when the download is complete: shut down the system, switch to sleeping mode or quit Folx. 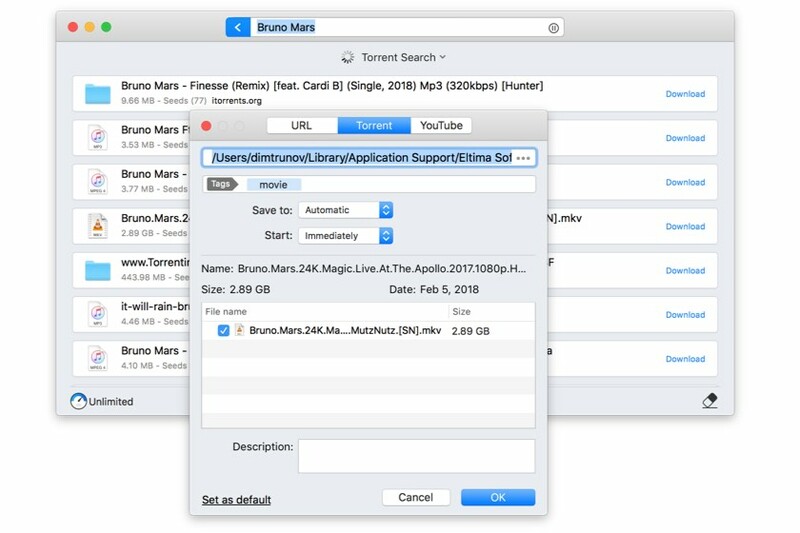 Folx BitTorrent Mac client automatically adds downloaded music & videos to iTunes playlists named as tags assigned to downloaded content. When downloading from websites that require authentication, you can ask Folx to save login and password for these sites. Next time you are starting a download from this website, you won’t need to sign in manually. Folx can also keep passwords for FTP and HTTP websites. Free Folx lets you save up to two entries. Folx will download videos from YouTube and let you set the format for the downloaded movies. And in the case where you don’t actually want the video itself and are only interested to have a soundtrack from it, Folx is happy to help! You can start downloads manually, on schedule or immediately upon discovering the video.